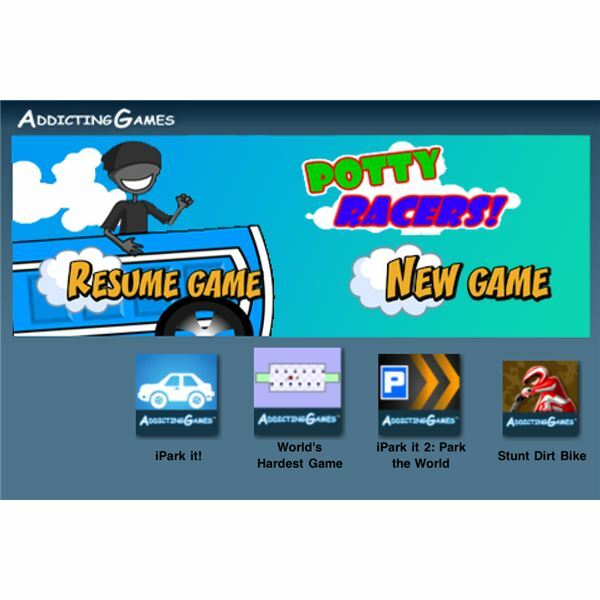 The Addicting Games' Potty Racers iPhone game is a pretty simple stunt game packed with stinky humor that will either please or annoy you. I mean, it's really up to you whether you can take the literal toilet humor that this game offers. I say literal toilet humor because the game tasks you to control a portable toilet and launch it into the air and make sure that it lands on all of its four wheels to achieve the farthest distance from the starting point as possible. You can also pull off some crazy stunts while your potty is in the air. The important thing here is to make sure that your potty lands safely and does not get destroyed upon hitting the floor. The further you land the potty away from the starting point, the more points you get. And what will you do with race credits you accumulate? Buy upgrades for your potty of course – to improve its performance and increase its trajectory – enabling it to go as far as it can. These upgrades include better tires, airfoils and even jet packs. The game also lets you instantly see how far your potty has gone, you can see your score displayed at the upper right hand corner of your iPhone's screen as soon as your potty lands on the ground. That pretty much sum up what this iPhone game is all about. For its other features, the game gives you multiple hills to tackle and conquer, easy and hard settings, and the constant addition of upgrades. There's some minor cool animation effects as well, including the appearance of a yellow streak left behind by your potty and some more. The overall graphics rendering is nothing special which is pretty understandable since the game developers probably wanted you to focus on the humor that this game is aiming to provide. As mentioned, Potty Racers is a pretty simple game. Simple graphics rendition, simple animation, simple gameplay. This is not a game for every iPhone gamer. Even parents might not approve of its concept and may want to prevent their kids from playing it. But if kids find a way to get this game and their parents play them as well, the game could be worth a few hours of time. In fact, kids and their parents can play alternately and find out who's the better potty racer. Or if you've got a few hours to burn while waiting for an important event or meeting, Potty Racers could be a good companion and time-waster. Potty Racers is available from the App Store for $0.99. Is it worth your 1 buck? Well, yes.